This silver plated Inspirational Heart Trinket Box with Engraved Cross is the perfect place for her to keep her precious mementos. 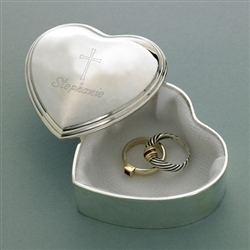 An excellent keepsake gift, she'll be reminded of her faith whether displayed on the vanity, dressing table, or nightstand. Measures 3" x 3" x 1 1/4". Personalize with one line of up to 15 characters.